Be the first to share your favorite memory, photo or story of Treva. This memorial page is dedicated for family, friends and future generations to celebrate the life of their loved one. 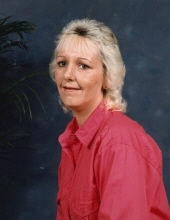 Treva Jean Prater Beasley, 62 of Pikeville, TN., died Friday, November 30, 2018. Treva was a member of Mooneyham Freewill Baptist Church, enjoyed her flowers, and spending time with her family. Treva was preceded in death by her parents, Charlie V. and Winona Faye Smartt Prater; daughter, Deborah Ann Wright; brother, Wayne Prater; sister, Kay Simmons. Survivors include her husband of thirty-one years, Price Beasley; son, Bobby (Kimberly) Wright; daughter, Teresa Regina (Mike) Smith; brother, Benny Prater; six grandchildren; several nieces, nephews, cousins, and a host of friends. A celebration of life will be 12:00 pm CST Tuesday, December 4, 2018 at Mooneyham Freewill Baptist Church with Bro. Wayne Sullivan officiating. Burial will be in Hitchcock Cemetery. The family will receive friends 11:00 am CST Monday, December 3, 2018. "Email Address" would like to share the life celebration of Treva Jean Beasley. Click on the "link" to go to share a favorite memory or leave a condolence message for the family.